Today the Palm Beach Post ran a story on a proposal I had written to rename a park in downtown Boynton Beach for Fred S. Dewey and Byrd Spilman Dewey. This week’s blog will relate how this discovery was made. It happened this way: Readers from earlier blogs will know that I did quite a bit of land research on who were the original owners of land in the Boynton area. As part of that search, I wanted to see the history of the downtown Boynton Beach area and the ocean coastline. I opened the old registry books to the section, township and range for Boynton Beach. A rather puzzling mystery presented itself – it was not the name Nathan S. Boynton that was appearing, but the name Birdie Dewey, over and over again on that very first page of entries. I found that strange because I had never heard the name – who was Birdie Dewey? I searched for Birdie Dewey and found the Lake Worth Pioneer’s website that had a page for Fred S. Dewey and his wife Birdie Dewey, whose full name was Byrd Spilman Dewey. The page indicated that Birdie Dewey was an author. area to relocate to Jamaica. Birdie S. Dewey purchased the land January 29, 1892, all 120 acres, for $700.00. This was the 40 acres that made up the original townsite and 80 acres along the Intracoastal Waterway. It turns out that Birdie Dewey had quite the eye for real estate, and bought and sold land throughout Palm Beach and Broward counties. I looked in the original plat books at the courthouse and found that indeed the Deweys had filed the original plat for the Town of Boynton on September 26, 1897. They also platted “Dewey’s Subdivision” on the other 80 acres. The lots in Dewey’s subdivision were subdivided into five-acre plots for sale as farmland. The rich muck soil along the canal was perfect for raising tomatoes. Mr. Dewey even had the first orange grove in Boynton, which was located south of where Ocean Avenue is today. They sold lots in the town to settlers along the streets they had named for native plants, such as Palm Street and Poinciana Street. The only street to retain its original name is Ocean Avenue; the rest of the streets were renamed in the 1950s to numbered streets and avenues to aid in postal delivery. One street disappeared completely – Dewey Place, which would be slightly east of the Oscar Magnuson house on Ocean Avenue. The Deweys had sold their holdings in West Palm Beach and had built a fine two-story home at the corner of Federal Highway and Boynton Beach Boulevard. They had planned to retire to Boynton; those plans were short-lived as Mr. Dewey’s health took a turn for the worse, the direct result of his service in the Civil War. The Deweys left in June 1910; Mrs. Dewey donated her extensive collection of literature and a small lending library was started at the Post Office. Mr. Dewey entered a military hospital in Tennessee and was in and out of military hospitals until his death in 1919 at the Sawtelle Old Soldiers Home in California. He is buried in the Los Angeles National Cemetery. 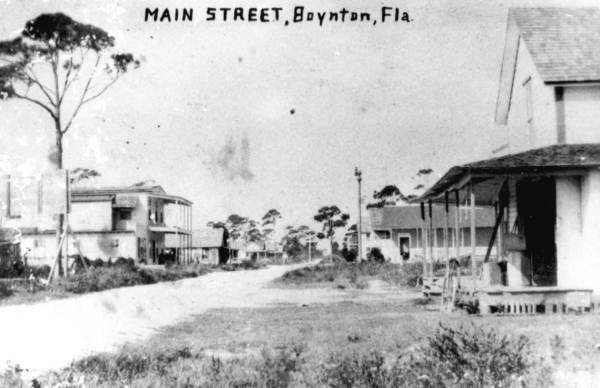 Mrs. Dewey sold her last holdings in Boynton in 1925. She passed away in Jacksonville in 1942, and is buried in the Greenlawn Cemetery. It is my great hope that these two pioneers will be recognized by the city they founded. January 29 will mark the 120th anniversary of their land purchase, so the timing of this could not be better. Our pioneer days before Flagler’s arrival are times of unimaginable beauty – and sacrifice. The Deweys truly embody that spirit. UPDATE:The City Council of Boynton Beach did not approve the renaming of the park for the Deweys. 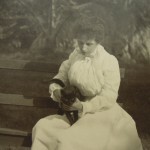 Mrs. Dewey’s image is from the book The Blessed Isle, published in 1907; the other images are from the Florida State archives through the Florida Memory Project. in Palm Beach was the Hotel Royal Poinciana, which opened in 1894 and was expanded many times. His second hotel was originally called the Palm Beach Inn, and was located on the ocean, whereas the Royal Poinciana was located on Lake Worth. 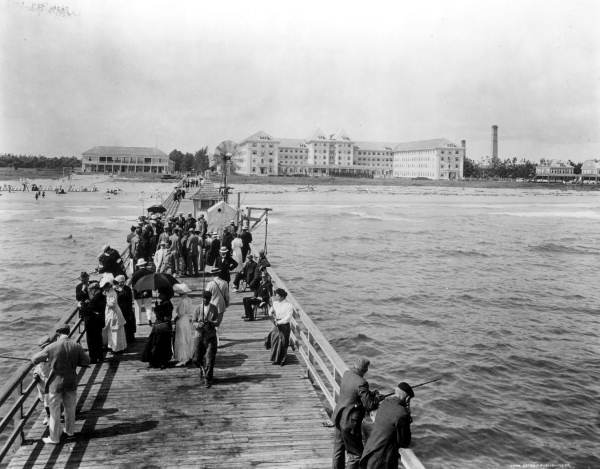 Guests would ask if they could book rooms “over by the breakers,” so the name of the inn was changed to The Breakers. 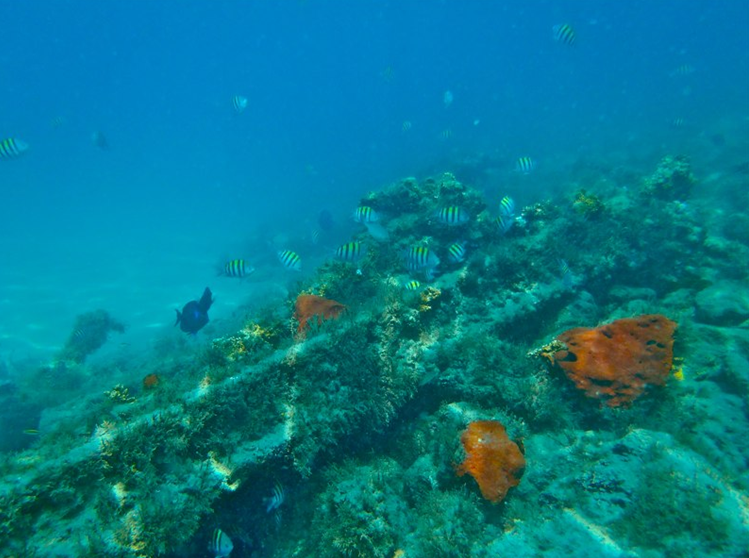 The research for this blog came primarily from a Tequesta historical journal article written by Sue Pope Burkhardt entitled The Port of Palm Beach: The Breakers Pier in 1973. 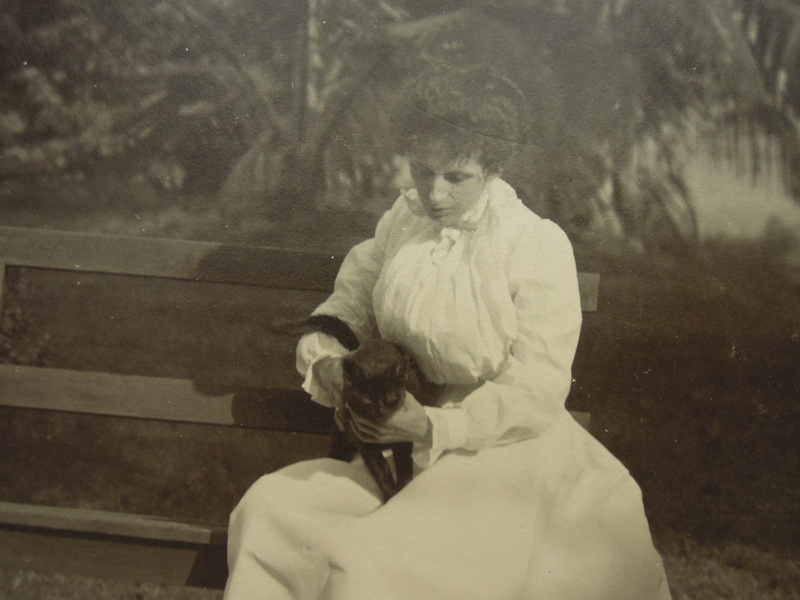 She was married to Henry Burkhardt, one of the original Lake Worth region pioneers. At that time there was no port in Palm Beach; consequently Flagler decided to build not only a freight port, but also a passenger port which allowed guests to board or disembark from steamers. The steamers, part of the Palm Beach-Nassau Steamship Line, offered tourists direct passage to Flagler’s hotel in Nassau, the Royal Victorian. Worth and Palm Beach, and terminate on the Breakers Pier, where passengers then boarded steamers to the Bahamas. Steamships carrying cargo also docked at the pier, and offloaded much of the material that was used to build the original Breakers hotel, which burned in 1903. 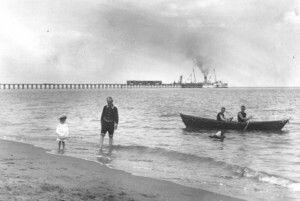 The use of the pier as a railway was shortlived. By the time Flagler had built his magnificent residence Whitehall, the train had ceased its run to the pier. The train was moved to the north end of the Hotel Royal Poinciana, which became the new termination point of the railway. The Nassau steamships then began to run from the Port of Miami over to the Bahamas. 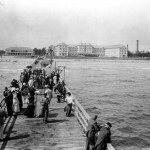 The Breakers Pier then started a new life as a fishing and strolling pier, where guests enjoyed views of the coast line. Fishing was great at that time, being so close to the Gulfstream and its warm waters and not subject to today’s pollution and overfishing. flagship Mayflower. 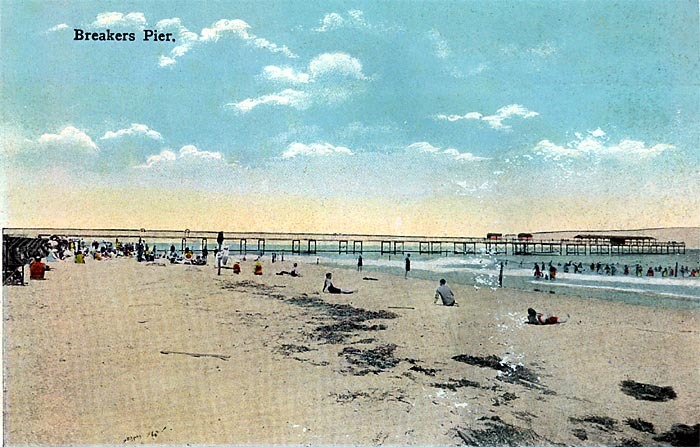 There was even a fear at one time during the Spanish-American War that the Florida coast might be invaded, so the Coast Guard was stationed on the pier. Mrs. Burkhardt even relates that Springfield rifles were distributed to each household as a civil defense precaution. 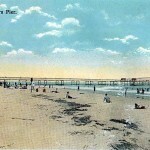 The pier was severely damaged in the 1928 hurricane, and was demolished a few years later. 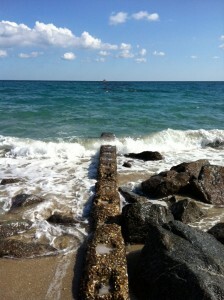 I wondered if anything was left from the pier, so I walked there from Clarke’s beach at low tide. 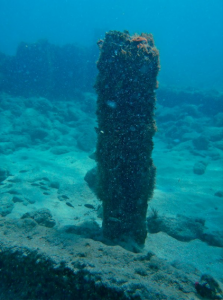 I knew where the pier was based on aerial photography, which still shows a long dark streak underwater where the pier was located. I also determined its location from looking at a 1920 Sanborn map of the Breakers Hotel. probably of stainless steel to still be so shiny. The dark streak is still clearly visible under the water where the pier was located, even visible from shore. As I was there, a group of snorkelers led by a Breakers hotel employee were just emerging from the surf. 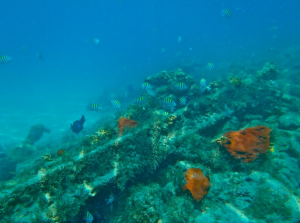 The Breakers employee described what is left of the pier in this short audio interview – click on the following link – Interview with Breakers Employee. I’m sure none of the guests who stay at the Breakers and few of the employees realize the magnificent pier that once stood on the shoreline by the hotel. Its ghost is still there, now an artifact, raptured in the deep. 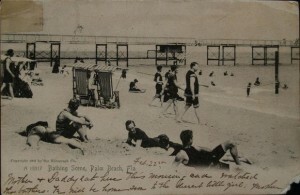 Vintage postcards are from the Florida Memory Project archive; underwater photographs are courtesy of Steve Anton.